For Australia's federal system of government, see Federalism in Australia. The efforts to bring about federation in the mid-19th century were dogged by the lack of popular support for the movement. A number of conventions were held during the 1890s to develop a constitution for the Commonwealth. Sir Henry Parkes, Premier of New South Wales, was instrumental in this process. Sir Edmund Barton, second only to Parkes in the length of his commitment to the federation cause, was the caretaker Prime Minister of Australia at the inaugural national election in 1901 in March 1901. The election returned Barton as prime minister, though without a majority. A serious movement for Federation of the colonies arose in the late 1880s, a time when there was increasing nationalism amongst Australians, the great majority of whom were native-born. The idea of being "Australian" began to be celebrated in songs and poems. This was fostered by improvements in transport and communications, such as the establishment of a telegraph system between the colonies in 1872. The Australian colonies were also influenced by other federations which had emerged around the world, such as the United States and Canada. Sir Henry Parkes, then Colonial Secretary of New South Wales, first proposed a Federal Council body in 1867. After it was rejected by the British Secretary of State for the Colonies, the Duke of Buckingham, Parkes brought up the issue again in 1880, this time as the Premier of New South Wales. At the conference, representatives from Victoria, New South Wales and South Australia considered a number of issues including federation, communication, Chinese immigration, vine diseases and uniform tariff rates. The Federation had the potential to ensure that throughout the continent, trade, and interstate commerce would be unaffected by protectionism and measurement and transport would be standardised. The final (and successful) push for a Federal Council came at an Intercolonial Convention in Sydney in November and December 1883. The trigger was the British rejection of Queensland's unilateral annexation of New Guinea and the British Government wish to see a federalised Australasia. The convention was called to debate the strategies needed to counter the activities of the German and French in New Guinea and in New Hebrides. Sir Samuel Griffith, the Premier of Queensland, drafted a bill to constitute the Federal Council. 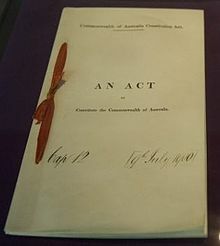 The conference successfully petitioned the Imperial Parliament to enact the bill as the Federal Council of Australasia Act 1885. As a result, a Federal Council of Australasia was formed, to represent the affairs of the colonies in their relations with the South Pacific islands. New South Wales and New Zealand did not join. The self-governing colonies of Queensland, Tasmania and Victoria, as well as the Crown Colonies of Western Australia and Fiji, became involved. South Australia was briefly a member between 1888 and 1890. The Federal Council had powers to legislate directly upon certain matters, such as in relation to extradition, regulation of fisheries, and so on, but it did not have a permanent secretariat, executive powers, or any revenue of its own. Furthermore, the absence of the powerful colony of New South Wales weakened its representative value. Nevertheless, it was the first major form of inter-colonial co-operation. It provided an opportunity for Federalists from around the country to meet and exchange ideas. The means by which the Council was established endorsed the continuing role that the Imperial Parliament would have in the development of Australia's constitutional structure. In terms of the Federal Council of Australia Act, the Australian drafters established a number of powers dealing with their "common interest" which would later be replicated in the Australian Constitution, especially section 51. The individual colonies, Victoria excepted, were somewhat wary of Federation. Politicians from the smaller colonies, in particular, disliked the very idea of delegating power to a national government; they feared that any such government would inevitably be dominated by the more populous New South Wales and Victoria. Queensland, for its part, worried that the advent of race-based national legislation would restrict the importing of kanaka labourers, thereby jeopardising its sugar cane industry. These were not the only concerns of those resistant to federation. Smaller colonies also worried about the abolition of tariffs, which would deprive them of a large proportion of their revenue, and leave their commerce at the mercy of the larger states. New South Wales, traditionally free-trade in its outlook, wanted to be satisfied that the federation's tariff policy would not be protectionist. Victorian Premier James Service described fiscal union as "the lion in the way" of federation. A further fundamental issue was how to distribute the excess customs duties from the central government to the states. For the larger colonies there was the possibility (which never became an actuality) that they could be required to subsidise the struggling economies of Tasmania, South Australia and Western Australia. Even without the concerns, there was debate about the form of government that a federation would take. Experience of other federations was less than inspiring. In particular, the United States had experienced the traumatic Civil War. The nascent Australian labour movement was less than wholly committed in its support for federation. On the one hand, nationalist sentiment was strong within the labour movement and there was much support for the idea of White Australia. On the other hand, labour representatives feared that federation would distract attention from the need for social and industrial reform, and further entrench the power of the conservative forces. The federal conventions included no representatives of organised labour. In fact, the proposed federal constitution was criticised by labour representatives as being too conservative. These representatives wanted to see a federal government with more power to legislate on issues such as wages and prices. They also regarded the proposed senate as much too powerful, with the capacity to block attempts at social and political reform, much as the colonial upper houses were quite openly doing at that time. Religious factors played a small but not trivial part in disputes over whether federation was desirable or even possible. As a general rule, pro-federation leaders were Protestants, while Catholics' enthusiasm for federation was much weaker, not least because Parkes had been militantly anti-Catholic for decades (and because the labour movement was disproportionately Catholic in its membership). In the early 1890s two meetings established the need for federation and set the framework for this to occur. An informal meeting attended by official representatives from the Australasian colonies was held in 1890. This led to the first National Australasian Convention, meeting in Sydney in 1891. New Zealand was represented at both the conference and the Convention, although its delegates indicated that it would be unlikely to join the Federation at its foundation, but it would probably be interested in doing so at a later date. The Conference of 1890 was organised at the instigation of Parkes. The account of the calling of the 1890 conference usually begins with Lord Carrington, the Governor of New South Wales, goading the ageing Parkes at a luncheon on 15 June 1889. Parkes reportedly boasted that he "could confederate these colonies in twelve months". Carrington retorted, "Then why don't you do it? It would be a glorious finish to your life." Parkes the next day wrote to the Premier of Victoria, Duncan Gillies, offering to advance the cause of Federation. Gillies's response was predictably cool, given the reluctance of Parkes to bring New South Wales into the Federal Council. In October Parkes travelled north to Brisbane and met with Griffith and Sir Thomas McIlwraith. On the return journey, he stopped just south of the colonial border, and delivered the historic Tenterfield Oration on 24 October 1889, stating that the time had come for the colonies to consider Australian federation. Through the latter part of 1889 the premiers and governors corresponded and agreed for an informal meeting to be called. The membership was: New South Wales, Parkes (Premier) and William McMillan (Colonial Treasurer); Victoria, Duncan Gillies (Premier) and Alfred Deakin (Chief Secretary); Queensland, Sir Samuel Griffith (Leader of the Opposition) and John Murtagh Macrossan (Colonial Secretary); South Australia, Dr. John Cockburn (Premier) and Thomas Playford (Leader of the Opposition); Tasmania, Andrew Inglis Clark (Attorney-General) and Stafford Bird (Treasurer); Western Australia, Sir James George Lee Steere (Speaker); New Zealand, Captain William Russell (Colonial Secretary) and Sir John Hall. 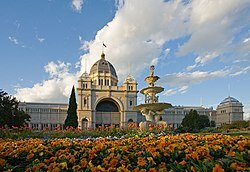 When the conference met at the Victorian Parliament in Melbourne on 6 February, the delegates were confronted with a scorching summer maximum temperature of 39.7 °C (103.5 °F) in the shade. The Conference debated whether or not the time was ripe to proceed with federation. While some of the delegates agreed it was, the smaller states were not as enthusiastic. Thomas Playford from South Australia indicated the tariff question and lack of popular support as hurdles. Similarly, Sir James Lee Steere from Western Australia and the New Zealand delegates suggested there was little support for federation in their respective colonies. A basic question at this early assembly was how to structure the federation within the Westminster tradition of government. The British North America Act (1867), which had confederated the Canadian provinces, provided a model with respect to the relations between the federation and the Crown. There was less enthusiasm, however, for the centralism of the Canadian Constitution, especially from the smaller states. Following the conference of 1890, the Canadian federal model was no longer considered appropriate for the Australian situation. Although the Swiss Federal Constitution provided another example, it was inevitable that the delegates should look to the Constitution of the United States as the other major model of a federation within the English-speaking world. It gave just a few powers to the federal government and left the majority of matters within the legislative competence of the states. It also provided that the Senate should consist of an equal number of members from each State while the Lower House should reflect the national distribution of population. Andrew Inglis Clark, a long-time admirer of American federal institutions, introduced the US Constitution as an example of the protection of States' rights. He presented it as an alternative to the Canadian model, arguing that Canada was "an instance of amalgamation rather than Federation." The introduction by Deakin of James Bryce's The American Commonwealth also had far-reaching influence. The conference in Melbourne ended with an agreement by the delegates that the time for federation had arrived. A. I. Clark had given considerable thought towards a suitable constitution for Australia. In May 1890, he travelled to London to conduct an appeal on behalf of the Government of Tasmania before the Privy Council. During this trip, he began writing a draft constitution, taking the main provisions of the British North America Act and its supplements up through 1890, the US Constitution, the Federal Council of Australasia Act, and various Australian colonial constitutions. Clark returned from London by way of Boston, Massachusetts, where he held discussions about his draft with Oliver Wendell Holmes, Jr., and Moncure Conway among others. There are three separate and equal branches – the Parliament, the Executive, and the Judicature. Upon his return to Hobart in early November 1890, with the technical aid of W. O. Wise, the Tasmanian Parliamentary Draftsman, Clark completed the final form of the Draft Constitution and had a number of copies printed. In February 1891, Inglis Clark circulated copies of his draft to Parkes, Barton and probably Playford as well. This draft was always intended to be a private working document, and was never published. The Parliament proposed at the Convention of 1891 was to adopt the nomenclature of the United States Congress. This proposal provided the broad outline of a Federal government. Its lower house was to be elected by districts drawn up on the basis of their population, while in the Senate there was to be equal representation for each "province". This American model was mixed with the Westminster system by which the Prime Minister and other ministers would be appointed by the representative of the British Crown from among the members of the political party holding a majority in the lower House. Griffith identified with great clarity at the Sydney Convention perhaps the greatest problem of all: how to structure the relationship between the lower and upper houses within the Federal Parliament. The main division of opinion centred on the contention of Alfred Deakin, that the lower house must be supreme, as opposed to the views of Barton, John Cockburn and others, that a strong Senate with co-ordinate powers was essential. Griffith himself recommended that the doctrine of responsible government should be left open, or substantially modified to accord with the Federal structure. Over the Easter weekend in 1891, Griffith edited Clark's draft aboard the Queensland Government's steam yacht Lucinda. (Clark was not present, as he was ill with influenza in Sydney). Griffith's draft Constitution was submitted to colonial parliaments but it lapsed in New South Wales, after which the other colonies were unwilling to proceed. The importance of the draft Constitution of 1891 was recognised by John La Nauze when he flatly declared that "The draft of 1891 is the Constitution of 1900, not its father or grandfather." In the Twenty-First Century, however, a lively debate has sprung up as to whether the principal credit for this draft belongs to Queensland's Sir Samuel Griffith or Tasmania's Andrew Inglis Clark. The debate began with the publication of Peter Botsman's The Great Constitutional Swindle: A Citizen's Guide to the Australian Constitution in 2000, and a biography of Andrew Inglis Clark by F.M. Neasey and L.J. Neasey published by the University of Tasmania Law Press in 2001. The traditional view attached almost sole responsibility for the 1891 draft to Griffith. Quick and Garran, for instance, state curtly that Griffith "had the chief hand in the actual drafting of the Bill." Given that the authors of this highly respected work were themselves active members of the federal movement, it may be presumed that this view represents - if not the complete truth - then, at least, the consensus opinion amongst Australia's "founding fathers". Before the National Australasian Convention in Sydney in 1891 he [Clark] circulated his own draft constitution bill. This was practically a transcript of relevant provisions from the British North American Act, the United States Constitution and the Federal Council Act, arranged systematically, but it was to be of great use to the drafting committee at the convention. Parkes received it with reservations, suggesting that 'the structure should be evolved bit by bit'. George Higinbotham admitted the 'acknowledged defects & disadvantages' of responsible government, but criticized Clark's plan to separate the executive and the legislature. Clark's draft also differed from the adopted constitution in his proposal for 'a separate federal judiciary', with the new Supreme Court replacing the Privy Council as the highest court of appeal on all questions of law, which would be 'a wholesome innovation upon the American system'. He became a member of the Constitutional Committee and chairman of the Judiciary Committee. Although he took little part in the debates he assisted (Sir) Samuel Griffith, (Sir) Edmund Barton and Charles Cameron Kingston in revising Griffith's original draft of the adopted constitution on the Queensland government's steam yacht, Lucinda; though he was too ill to be present when the main work was done, his own draft had been the basis for most of Griffith's text. It is easy to point to the document and dismiss it as a mere ‘cut and paste’ from known provisions. While there is some validity in such observations it does tend to overlook the fact that there are very few variations to be added once the basic structure is agreed. So for instance, there was always going to be parts dealing with the executive, the parliament and the judiciary in any Australian constitution. The fact that Inglis Clark modelled his on the American Constitution is no surprise once that basic decision was made. Issues of the respective legislative powers, the role of the states, the power of amendment and financial questions were the detail of the debate that the framers were about to address in 1891. The revival of the federal movement stemmed from the growth of federal leagues and nationalist organisations that were committed to federation, such as the Australian Natives' Association. There were two so-called People's Conventions held in Corowa and Bathurst. In 1893 John Quick, who had attended the Corowa convention, drew up a bill which became the basis of discussion at the Adelaide Convention (see below) and is considered to have contributed largely to the eventual constitution. Quick with Robert Garran went on to publish The Annotated Constitution of the Australian Commonwealth in 1901, which is widely regarded as one of the most authoritative works on the Australian Constitution. In 1895 a proposal was accepted by the premiers of the Australian colonies to establish a new Convention by popular vote, with the resulting draft of the constitution being submitted to the electors of each colony in a referendum. The Convention held meetings over the course of a year, beginning first in Adelaide in 1897, later meeting in Sydney, and culminating in Melbourne in March 1898. After the Adelaide meeting, the colonial Parliaments took the opportunity to debate the emerging Bill and to suggest changes. The basic principles discussed in 1891 were adopted, with the addition of the principle of responsible government. There was also a consensus for more democracy in the constitutional structure. It was agreed that the Senate should be chosen by popular vote with the voters in each State acting as one electorate. A draft bill was drawn up in 1898, and then sent to each colony to be ratified by the electorate. Referendums were held in four of the colonies in June 1898. There were majority votes in all four of them, however, the enabling legislation in New South Wales required the support of at least 80,000 voters for passage, and this number was not reached. A meeting of the colonial premiers in early 1899 agreed to a number of amendments to make the constitution more acceptable to New South Wales. Known as the "Braddon Clause", the amendments provided for the return of customs revenue to the states for ten years. It was also agreed that the new federal capital was to be built in New South Wales provided it was at least a hundred miles (160 km) from Sydney. In June 1899, the referendum was held again in all the colonies except for Western Australia, where the vote was not held until the following year. The majority vote was "yes" in all the colonies. The Commonwealth of Australia Constitution Act (UK) was passed on 5 July 1900 and given Royal Assent by Queen Victoria on 9 July 1900. It was proclaimed on 1 January 1901 in Centennial Park, Sydney. Sir Edmund Barton was sworn in as the interim Prime Minister, leading an interim Federal ministry of nine members. The new constitution established a bicameral Parliament, containing a Senate and a House of Representatives. The office of Governor-General was established as the Queen's representative; initially, this person was considered a representative of the British government. The Constitution also established a High Court, and divided the powers of government between the states and the new Commonwealth government. The site of a federal capital was disputed heavily between the two arch-rivals Sydney and Melbourne; the compromise was that a separate territory (the Australian Capital Territory) would be established within New South Wales to hold a new capital, while Parliament would sit in Melbourne until the new city was constructed. The site eventually chosen for the city became Canberra. ^ "Fiji and Australian Federation. – (From the Herald's own Correspondent.) Melbourne, Monday". The Maitland Mercury and Hunter River General Advertiser. 25 October 1883. Retrieved 5 May 2016. ^ note 2, at 18–21. ^ Martin, Henry Parkes, at 383. ^ Williams J, "'With Eyes Open': Andrew Inglis Clark and our Republican Tradition" (1995) 23(2) Federal Law Review 149 at 165. ^ Debates of the Australian Federation Conference, at 25. ^ La Nauze, J. A. The Making of the Australian Constitution. p. 273. ISBN 0-522-84016-7. ^ As early as 1874, he published a comparative study of the American, Canadian and Swiss constitutions. ^ Clark, Conway and Holmes were all Unitarians. Clark had met Conway when he travelled to Hobart, Tasmania, as part of his speaking tour in 1883. Conway later introduced Clark to Holmes. ^ Neasey, F. M.; Neasey, L. J. (2001). Andrew Inglis Clark. University of Tasmania Law Press. ISBN 0-85901-964-0. ^ La Nauze, note 11 at 78. ^ a b Botsman, Peter (2000). The Great Constitutional Swindle. Pluto Press Australia. p. 19. ISBN 1-86403-062-3. ^ Neasey, F.M. ; Neasey, L.J. (2001). Andrew Inglis Clark. Hobart: University of Tasmania Law Press. ^ Quick, John; Garran, Robert Randolph (1901). The annotated constitution of the Australian Commonwealth. Sydney: Angus and Robertson. p. 130. ^ Reynolds, Henry (1969). "Clark, Andrew Inglis (1848 -1907)". Australian Dictionary of Biography. Retrieved 31 January 2017. ^ Neasey, Frank (1991). "Andrew Inglis Clark and Australian Federation". Papers on Parliament. 13. ^ a b Williams, John (Professor) (2014). "Andrew Inglis Clark: Our Constitution and His Influence". Papers on Parliament. 61. ^ "Closer Look: The Australian Constitution". Parliamentary Education Office. Archived from the original on 5 April 2012. Retrieved 9 April 2012. ^ a b "Celebrating Federation" (PDF). Constitutional Centre of Western Australia. Retrieved 5 November 2015. ^ "Explore the Fascinating History of Federation Square". Fed Square Pty Ltd. 2011. Retrieved 14 March 2012. La Nauze, J, The Making of the Australian Constitution (Carlton: Melbourne University Press, 1972). McGrath, F, The Framers of the Australian Constitution (Brighton-le-Sands: Frank McGrath, 2003). Cockburn, John A. (1905). "Imperialism and Australian Conditions" . The Empire and the century. London: John Murray. pp. 446–461. McQueen, Humphrey, (1970/2004), A New Britannia, University of Queensland Press, Brisbane. Deakin, Alfred, 1880-1900 (Legislative Assembly politician) The Federal Story, The Inner History of the Federal Cause, Deakin 175 page eye witness report. Edited by J. A. La Nauze published by Melbourne University Press. Wikimedia Commons has media related to Federation of Australia.